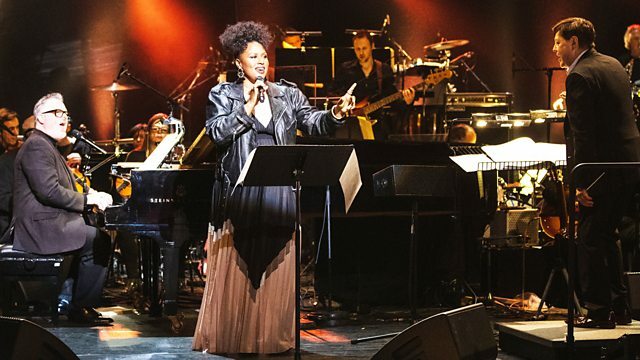 Guy Barker conducts the London Jazz Festival Orchestra in a celebration of song, including performances by Lisa Stansfield, Laila Biali and Allan Harris. Andrew McGregor presents the EFG London Jazz Festival's opening night gala, live from the Royal Festival Hall in London. The Jazz Voice is an annual celebration of singers and songwriting and the featured artists tonight include Lisa Stansfield, Laila Biali, Allan Harris, Deva Mahal, Anthony Strong and Zara McFarlane. Guy Barker conducts the 42-piece London Jazz Festival Orchestra and the event is hosted on stage by Jumoké Fashola. Performer: Lea DeLaria. Orchestra: The EFG London Jazz Festival Orchestra. Performer: Deva Mahal. Orchestra: The EFG London Jazz Festival Orchestra. Performer: Anthony Strong. Orchestra: The EFG London Jazz Festival Orchestra. Performer: Zara McFarlane. Orchestra: The EFG London Jazz Festival Orchestra. Performer: Lisa Stansfield. Orchestra: The EFG London Jazz Festival Orchestra. Performer: Laila Biali. Orchestra: The EFG London Jazz Festival Orchestra. Performer: Mariza. Orchestra: The EFG London Jazz Festival Orchestra. Performer: Allan Harris. Orchestra: The EFG London Jazz Festival Orchestra. Performer: Nancy Wilson. Performer: Cannonball Adderley. Performer: Amir ElSaffar. Performer: Hyper. Orchestra: EFG London Jazz Festival Orchestra. Conductor: Guy Barker. Celebrating jazz at the London Jazz Festival and beyond.